With the successful launch of ConnectCore we now look to introduce this technology to our most popular tapers. The benefits of ConnectCore, combined with best- selling fly line tapers and a unique tri-color line casting gauge (SureFire) makes for the finest performing trout lines on the market. 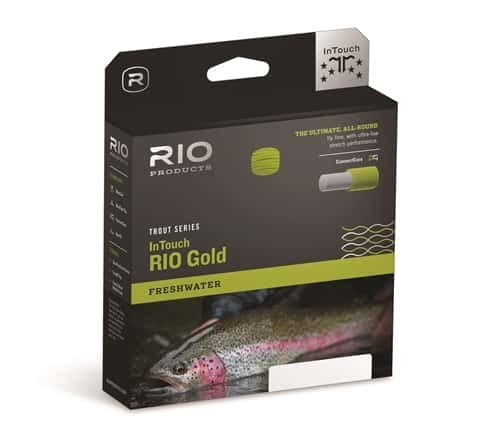 The best-selling trout line RIO has ever made, the RIO Gold, is now available with RIO's unique ultra-low stretch ConnectCore. The RIO Gold has a taper design that gives incredible loop stability at distance and a front taper that delivers perfect presentation of flies between sizes #2 and #22. The ultra-low stretch ConnectCore provides groundbreaking levels of sensitivity for intuitively better cast timing, easier line lift and sharp, precise mends. Lack of stretch also means enhanced detection of subtle takes and faster reaction time when setting the hook. The long head is ideal for the river fly fisher, and for controlling the fly at range.